View of the River Liffey in Ireland. It is the principle river of Dublin, rising in the Wicklow Mountains and flowing through the city cutting it in two. The artist has drawn this picture from the perspective of the Coal Quay or fruit market. Coal Quay or Wood Quay as it is also known, was the first quay to be built in Dublin and dates from c.900AD. Dublin city prospered during the 18th century and the quay was used to import large qualities of grain and coal. 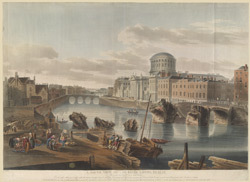 In 1802 a flood destroyed the bridge in the quay and the remains can be seen in the foreground of the picture. On the right is the Four Courts, the Irish law Courts, in the centre is Blood Bridge and behind that Queen’s Bridge. The Salute Battery and Phoenix Park can be seen in the background.